Regular readers are probably wondering: “Didn’t a new Sting album come out a few months ago? How come SSF hasn’t reviewed it?” Well, those people are right; it has taken me a while to get around to writing up a review for Sting’s latest album 57th and 9th, which came out in November 2016. The truth is, despite this being the first rock album from Sting in more than a decade, it didn’t make much of splash. For example, it didn’t make anyone’s end-of-the-year list. I think there’s probably a good reason for the snub—the album was somewhat thrown together quickly (which was unwisely billed as a strength), and the lack of polish in the production and songwriting was evident in sometime unoriginal or staid music. 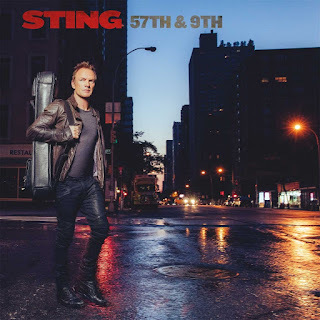 57th and 9th should not be dismissed outright, however; while perhaps not writing at the same level of Ten Summoner’s Tales (probably his best solo album), in 57th and 9th, Sting is for the most part not just sitting on his laurels by producing bad copies of his earlier music. Each new song gives us listeners something to grapple with, either musically or thematically. “Petrol Head” is the best song on the album; not only is it the song with the most energy (in two senses), but it doesn’t seem like it was hastily written or built. It has a catchy little melody, a nice tight little contrasting bridge section, and is chalk-full of religious and mythic imagery and reference. It also is probably both the most humorous and nuanced song on the album—both celebrating and poking fun of the macho road warrior of the American highway. I’m flummoxed why this song wasn’t picked as the lead single (maybe someone thought the references came too densely?). One of Sting’s songwriting strengths especially apparent in this song is that the chorus is not some monolithic block that comes back the same every time—when a chorus returns, he will often change up the words or even add phrases to the melody for emotion and musical impact. I wouldn’t be surprised if “Heading South on the Great North Road” (the second best song on the album) was a reject song from The Last Ship—at least it comes from the same spiritual place of Newcastle and a trail of migration for better opportunity. The title conveys a great image—dripping with failed dreams, disappointment and heartache, and a golden age lost. It succeeds in the folk song genre where “Pretty Young Soldier” (discussed below) fails, with enough verses for an emotional journey. For the topical challenges, “One Fine Day” takes on climate change, a topic sadly in need of more good songs, and while this song could be catchier, I’m sure it will be a regular at Greenpeace gatherings and other similar events. “Inshallah” is a solid song; a sympathetic lullaby telling the story of refugees who at great risk boat to Europe for a better life, and the Oscar-nominated “The Empty Chair” is from a film about a journalist who was captured, held captive, and then killed by ISIS. Other songs don’t quite live up to these; “I Can’t Stop Thinking about You,” the lead single, is a solid song with some surprises in the form and some twists in the verse lyrics, though the chorus is somewhat unimaginative. “Pretty Young Soldier” is Sting’s take on a cross-dressing folk song from 18th-century England—but the song isn’t quite long enough for this genre, and the chorus tries to moralize the cross-dressing in some strange way. “50,000” is probably the weakest song, and I could understand if critics stopped listening to album after hearing this, the second album track. It is more navel-gazing than I think Sting’s audience is ready for. Also, I have the same complaint with this song as I did with the last Taylor Swift album—a string of the same repeated notes does not make a good melody. He doesn’t even try to spice up the note with a catchy rhythm. I got to see Sting in a live show a week before the album came out, and while he was mostly playing his greatest hits (he did play two from the new album), he doesn’t like to keep things the same. He changed things up, tries new things, and keeps the audience thinking. 57th and 9th, though somewhat flawed, still does that, too. It was not disappointing to have a little more original new music, and I would recommend it to those who have liked Sting in the past. There’s even a song in a mixed meter! (“If You Can’t Love Me,” in 7).